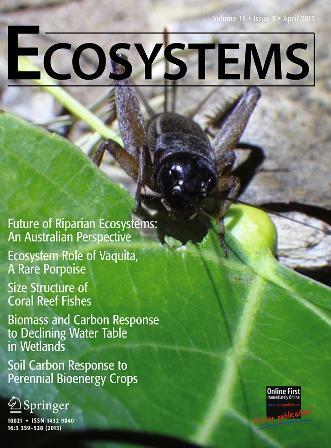 One of my photos ended up on the cover of the issue of Ecosystems containing a paper I co-authored with Julie Stromberg, Mark Dixon, and Thomas Meixner. This entry was posted in Science and tagged Arthropod, Climate Change, Drought, Ecology, Food Web, Insect, Riparian, Water, Water Stress. Bookmark the permalink.